Today, we have Rikkugrape, who caught my eye for some of the most accurate Zelda cosplay. Andy: What was the first Convention you attended? Why did you pick thatConvention in particular? RikkuGrape: The first convention I attended was KumoriCon in Vancouver, WA. It was the first convention I had ever heard of, and it was close to my house. At the time it was pretty small, but it was so much fun I’ve been going to conventions ever since! Andy: What first inspired you to start cosplaying? What was the first cosplay you made? How much of that cosplay was sewing and how much was buying the clothes? RikkuGrape: The first time I cosplayed I didn’t even know what cosplaying was. My friend had a costume-themed birthday party and she told me to dress up as one of my favorite characters, so I did! It wasn’t really a cosplay, but I tried! The first costume I ever made though was Rikku from Final Fantasy X and I sewed every piece myself…well, except for the shoes. I bought the shoes and then made “boot covers” for them. Andy: How did first learn how to sew? How long did it take for you to become skilled at sewing? What sewing skills do you hope to improve or learn? RikkuGrape: My friend and her mom first taught me how to sew. I don’t think I am by any means skilled at sewing yet, but I do know my way around a sewing machine pretty well. When I first learned, they taught me how to do a straight stitch and a knot. After that, everything I know is pretty much self taught or something I learned from the internet or friends. I’d really like to learn the conventional ways of sewing so I can apply that knowledge to the things I already know that are a bit less traditional. I think it would really help me create more professional products and be more efficient too! Andy: You have a healthy gamer love for the Zelda franchise, What is your favorite Zelda game to date? Do you prefer the old ones or the new versions? What were your feelings when you first played Ocarina of Time? RikkuGrape: My favorite Zelda game is Majora’s Mask. It’s so off-kilter, I just love it so much. My very first Zelda game was Ocarina of Time, so I’m partial to OoT and newer since those are the games I grew up with, though I do love the original Zelda games as well. When I first played Ocarina of Time I was really small. It came out in November 1998, so I was six years old. I remember playing it and I thought it was the coolest game ever because I would play on my brother’s account and he was at the very end so I would just ride Epona around and go fishing a lot. Then I tried playing it from the beginning, and I would get scared at all the bosses so I would have one of my brothers or my cousins beat them for me. I played all the in between parts though.It was pretty silly, but it worked, and I ended up beating the game at a young age which I was pretty proud of as a little girl. It has been a game series that has stuck with me ever since. Andy: If Link was so intrinsically attached to Zelda, romantically, who would he go steady with Saria or Malon? RikkuGrape: That is a very good question. I mean, there is a certain age difference between him and Saria, you know? And, she is Kokiri so she is going to stay a child for a long time. Not to mention she’s a sage so that is a lot of responsibility on her shoulders. I feel like she wouldn’t have time for a man! Plus she is already pretty confident and strong on her own. I guess I would have to say Malon. She is a pretty self-sufficient lady too, but I see a lot more common ground between her and Link, mainly that they are both Hylian and will age at the same rate. I mean, it might come off kind of strange if Link is in his 30s and wants to have children, but his wife is still prepubescent…just saying! But, either is a good choice. And in the game world I doubt any of what I mentioned really matters, after all it would be true love, right? Link can date whoever he wants! Andy: Some of your cosplay is Princess Zelda herself, Where you geeking out when you first time you donned her costume? What did you do make-up wise to make her seem more regal. 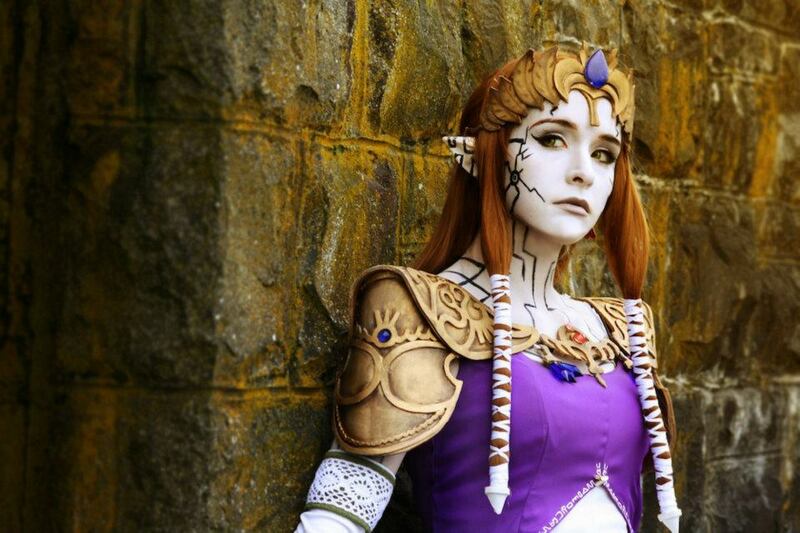 What was the dressing process for the Zelda costume? 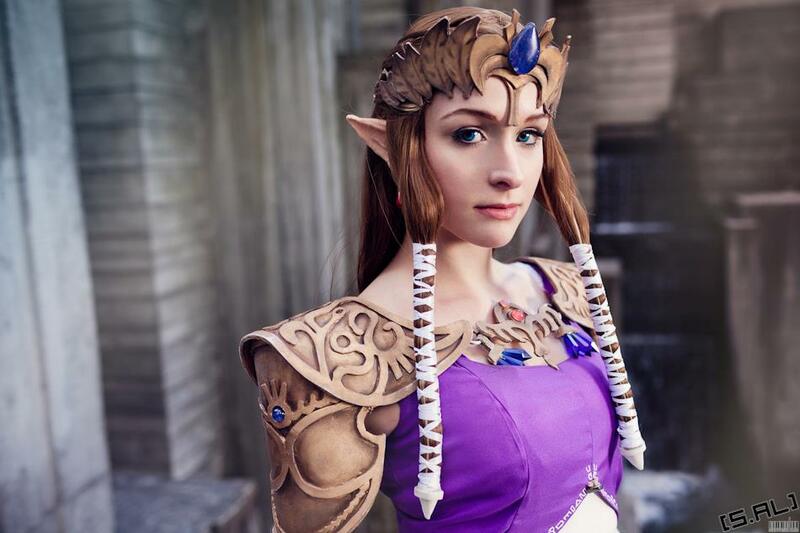 RikkuGrape: The first time I wore my Princess Zelda cosplay I was actually really nervous. I had worked really hard to try and bring her character to life and I was afraid to wear it out because I am not like Princess Zelda. She is very strong, and regal, and a princess and I am none of those things so it was a challenge for me to convey her in that way. 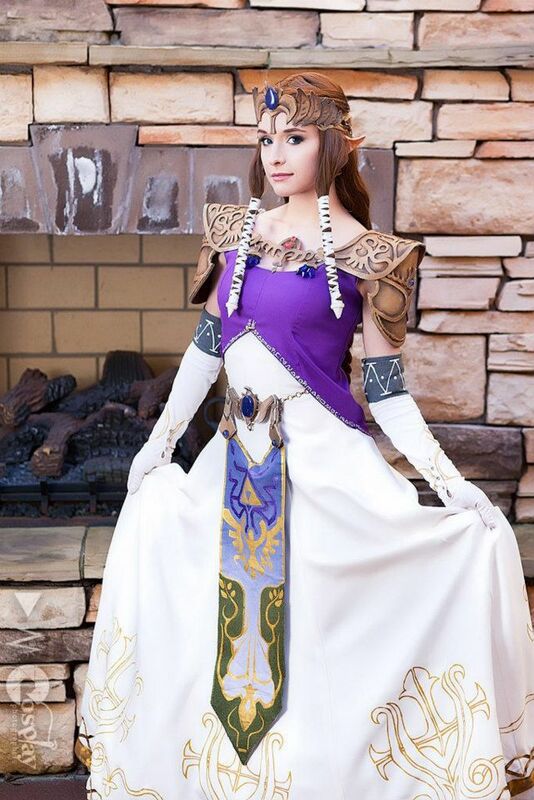 However, I love the Zelda series, and I love Princess Zelda, so even though I was scared, I had put my heart into making the costume and I knew that no matter what I was going to wear it and bring her to life in the best way I could. For the makeup, I used the same base I do in all my cosplays, foundation and a setting powder. But for Zelda I did a more natural pink/brown eye shadow, with eyeliner. I tried to create the sort of angular eye she has with a pair of really specific fake eyelashes and stratigically done eyeliner. After that I did some basic contouring to try and bring out the angles in my face and try and resemble her face structure which is very defined. I also had to fill in my eyebrows with a brown eyebrow pencil because my eyebrows aren’t as dark as hers, other than the color I tried to match the shape of hers with the high arch without straying too far from my natural eyebrow shape too.Getting in her costume is fairly simple. I layer a lot though, but otherwise it’s simple. Under the costume I wear leggings and a white tank top. I then put on the petticoat, the white dress, purple top, front tapestry, shoulder and chest armor pieces, wig, circlet, earrings, boots, and gloves! Oh, and I put my prosthetic ears on when I am doing my make up. Make up and ears always come first so I don’t get the costume dirty. Andy: Speaking of Zelda characters. another one you have in your gallery is Saria from Ocarina of Time. What in her character drew you to her as a cosplay choice? 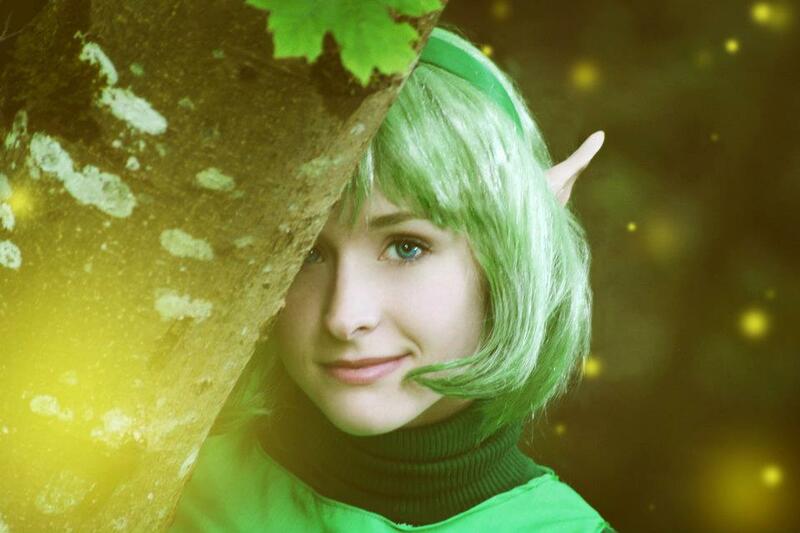 What fabrics or sewing choices did you make to bring Saria to life? RikkuGrape: I love Saria. I think she is adorable. When I was little Saria was my favorite character because I was able to relate to her the most, I think. She was a little girl, and so was I, not to mention she wears all green and green is my favorite color. Now that I’m older I really admire Saria for her strength as a sage and her steadfast heart. She is a great friend to Link. It was fun to cosplay her for a lot of reasons. I didn’t go really crazy with fabric for her cosplay. I made the jumper piece out of a green cotton, and the turtle neck I was able to purchase at Good Will, then I altered it to be what I needed. The belt I already had, and the shoes I did as well. They started out being brown, so I just changed them to be green. I made the ocarina out of paper clay, painted it with acrylics. The wig was white, so I dyed it green then styled it. Her cosplay wasn’t a technically difficult one, but it is one of my favorites. RikkuGrape: I opened my Etsy shop as a side “business” to sell my candles and my old costumes. I like Etsy because it’s pretty straightforward and user friendly, not to mention it is well known and opens you up to lots of people. It’s different than deviantArt because you can sell more than prints, which is nice. The Lon Lon Milk candles I made on a creative whim. I thought they would be cute and I wanted to broaden myself by trying something new, so I gave them a shot. Then I decided to sell them and people have really responded to them. It’s fun for me to create something that people love, it’s another good outlet for my creativity. Rikku as Zelda by Shunichi Al Hayashi! Andy: What effect does Facebook and Deviantart have on your cosplays? RikkuGrape: Facebook and DeviantArt are really great as far as my cosplays are concerned. It is a good way for me to keep track of my work, and also for others to see my progress. I try and upload a lot of progress work to FaceBook while I am creating a costume so that others can see what it is that I do. I know there are a lot of different ways to make things, but I like to put my methods out there incase someone could find the information useful. Andy: How did you connect with your photographers? How important is a cosplayers photographer choice? RikkuGrape: In all honesty a lot of the photographers I work with I have met me through friends, or simply walking around at a convention. Now they are all good friends of mine and I love working with all of them. I think a photographer is just as important as your cosplay. There are lots of talented photographers and they all have their own styles. There is no need to be picky, getting the chance to work with a great photographer is wonderful. I always accept an offer to work with someone new regardless of their style of photography. I think different styles create some really diverse and stunning images. Andy: What is something you wish you knew when you first started cosplaying, that you know now? Previous Article10 Ways Ouran High School Host Club Can Cheer You Up!